It’s Sunday and time to take inventory of my refrigerator and pantry as I plan for the following week. 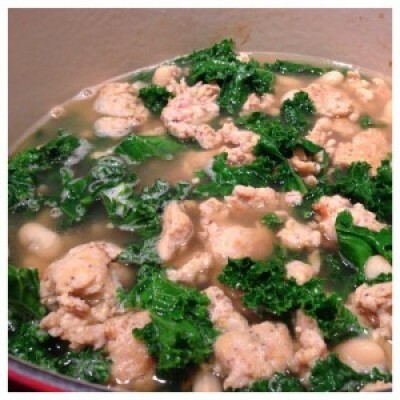 I decided it was a perfect day for soup and had everything to create my Chicken Sausage and Kale Soup. If you have other leftovers add them in such as sweet potatoes, celery, red peppers, carrots, etc. Be creative and enjoy this delicious soup! In a large dutch oven or pot over medium heat add in oil. Once hot add in sausage and cook for about 10 minutes. Break apart into small pieces while cooking using a wooden spoon. Add in kale, onion, garlic and carrots. Let cook for about 5 minutes then add in salt, pepper, parsley, basil, pepper flakes and broth. Bring to a boil add in beans then lower to a medium simmer, cover and let cook for about 20 minutes.